I can’t believe Thanksgiving is just a few weeks away. I don’t have a crowd coming but I thought I had better put together my Thanksgiving Tablescape for 2013. I kept things simple, neutral and natural. As always, I started with the linens. I looked at what I had and honestly, it all seemed sort of tired and old. I don’t mind old at all and love pretty much anything that’s vintage. There’s a fine line between old and vintage though…and some of my linens fall into the old category! So off I went to Pier 1. These place mats and salad plates were the inspiration I needed to put together a neutral yet welcoming table. Oh…and they were all on sale. I made the napkins from linen I already had. I cut 18 inch squares and frayed all the edges. After being washed they turned soft and the frayed edge was lovely. Here is a detailed tutorial on how to do the napkins: No Sew DIY Linen Napkins. I picked up pears to use as place card holders. I wanted to use Bosc pears because they are my favorite…but I couldn’t get any of them to stand up. You should have seen me in the Kroger store trying to find four with a flat bottom. I finally gave up and got these Anjou pears which in the end was a better choice because of the color. They pop right off the plates. The brown tags are from Hobby Lobby and I stamped them with our names. I cut boxwood from my bushes and filled four little stoneware pitchers. I added a sprig of Rosemary and placed them at each setting. 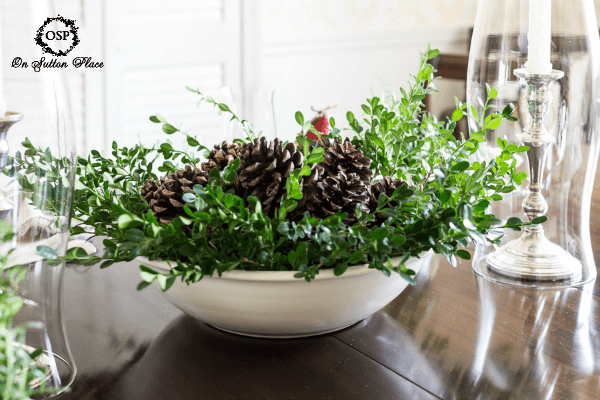 The centerpiece is more boxwood with pine cones nestled on top. I will be back tomorrow to show you how I put this together…it was so easy and quick. If I remember to add water it just might last until Christmas. That’s the plan anyway! Inspiration for table settings can be hard…sometimes you see something you like but don’t have any of the components. I’ve got just the thing to help you find something that will work for you. 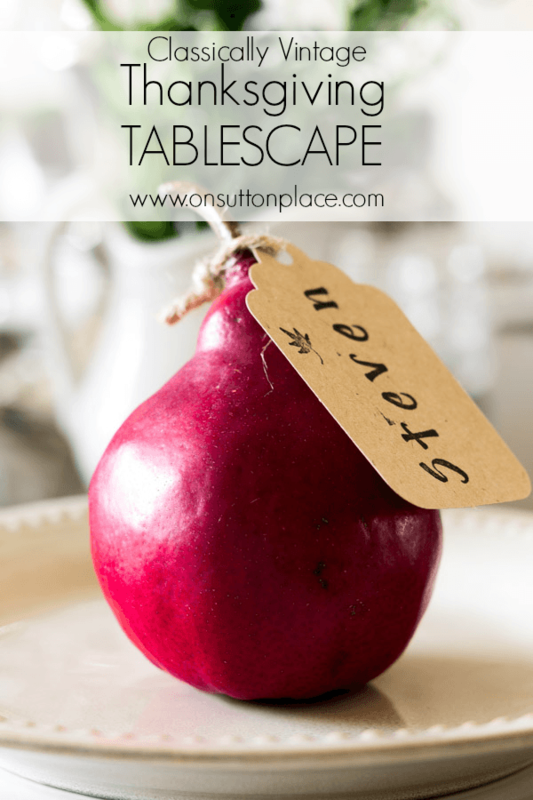 I’m joining 19 other bloggers and we’re sharing our Thanksgiving tablescapes over 4 days. All the links are below. These bloggers have fabulous style and I’m very glad to be listed among them. Thanks for stopping by…have a beautiful week! Simple, beautiful and just perfect… I love it! Bloggers are a weird breed, aren’t we, feeling up the produce for our decorative purposes. I just had a similar moments with apples at the store, and I’ve informed my family that they are hands-off! I love your lovely neutral and natural Thanksgiving table. Love the simplicity of this Ann. Your tablescapes are always amazing! Thank you for joining us on our tour! I love this look! Did you put a seam around the edge of the napkins? Oh Ann! Just gorgeous, as always. Those pears…oh my! They truly do pop off the plates. Well done! Oh Ann! You have such a distinct style! I could pick out your beautiful table anywhere. Clean lines, tasteful and just a hint of vintage. I love all you do… and this wonderful tablescaape is no exception! Ann, this is so beautiful! 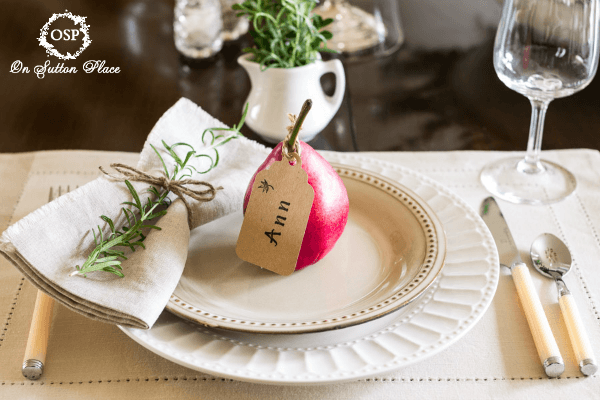 I love the simplicity and the fresh greenery… Using natural elements is my favorite and I just love the color of that pear! Glad to have been part of another tour with you! Ann everything looks so beautiful! Love the simplicity… it really shows off all the elegance of your Beautiful Fall Table. Hi Ann, Your table is just lovely. I adore the natural elements and the classic elements. I hope you have a wondrful holiday! Lovely table. Love the boxwood. A very special Thanksgiving setting. So pretty with all the neutrals and the pears just claiming centre stage. I was wondering if you put a seam along the frayed edge of the serviettes or if you just hoped for the best and that they wouldn’t unravel too much. Your thanksgiving table looks marvellous, I love the linen napkins and placemats. They fit perfectly into your home. Simple, neutral, natural…perfection. The table has a beautiful, classic look. I love the tags on the pear and may try that this year. Thanks for the inspiration! Simply perfect. I bet your dining room smells lovely with the rosemary! Ann- you style is always so fresh and beautiful… your table is no different. 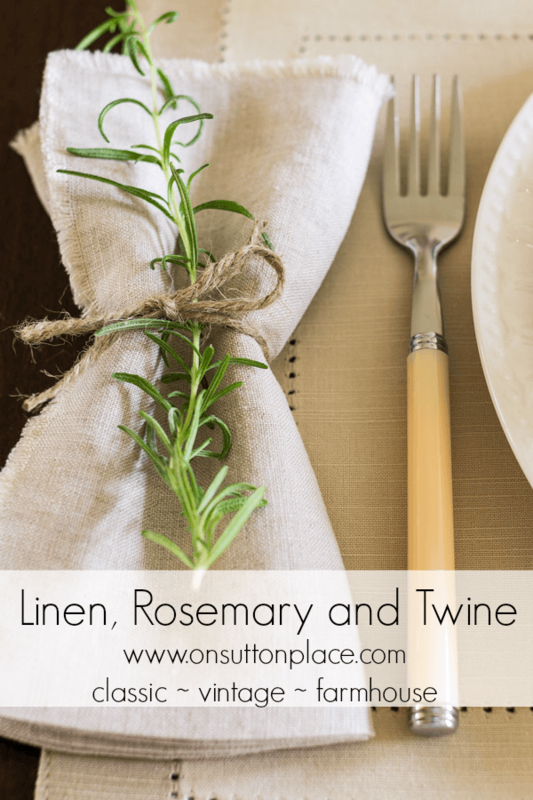 Ann, I just love that frayed edge on your linen napkins with the piece of rosemary tucked into the twine! How much simpler can it get, but the effect is pure elegance! You just have the magic touch! Pinning and sharing! Lovely, Ann!! I like simple. Simple elegance! Love this look!! I’m so in love with your tablescape. It’s simple yet stunning. The meal will SHINE among such a lovely setting! Thank you for having me Barb…we’ve all said it but I truly mean it from my heart. I appreciate your kindness and support so much. I’m beginning to think that just maybe this blogging thing might work out! What a pretty setting, Ann! Very simple, yet classic and elegant. Love the natural elements! Very pretty, Ann! 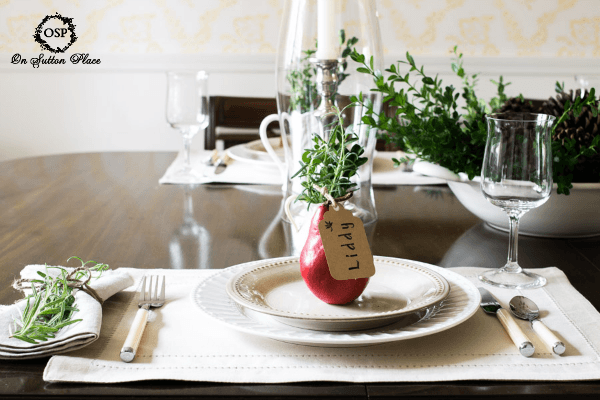 I love the simplicity of this tablescape and that you used natural greenery from around your own home. The pears look great! I think the red ones add such a great color here. Love the tags, too. I love the sprig of Rosemary on each napkin. Your tablescape is beautiful. Pardon my reading, it’s a pear LOL! Oh Ann – I love this soothing palate! The napkins are particularly inspiring to me – that frayed edge is delightful. I want to go make some of those pronto!! I’ve too have become obsessed with cutting boxwood and keeping it vases in my house, I love its simple beauty. Thank you for inspiring me! 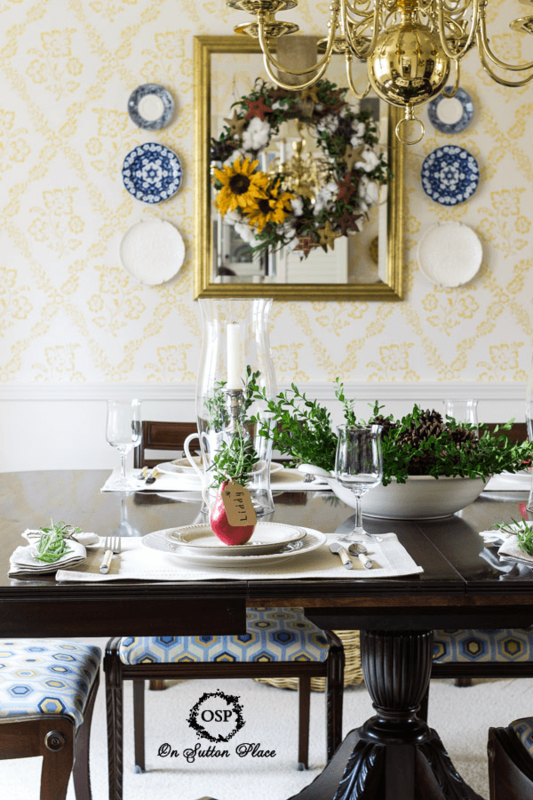 Ann – I love the classic beauty and simplicity of your tablescape. It really is gorgeous! What a great idea to add a sprig of rosemary to each napkin. I bet it will give off a wonderful aroma. Stunning Ann! 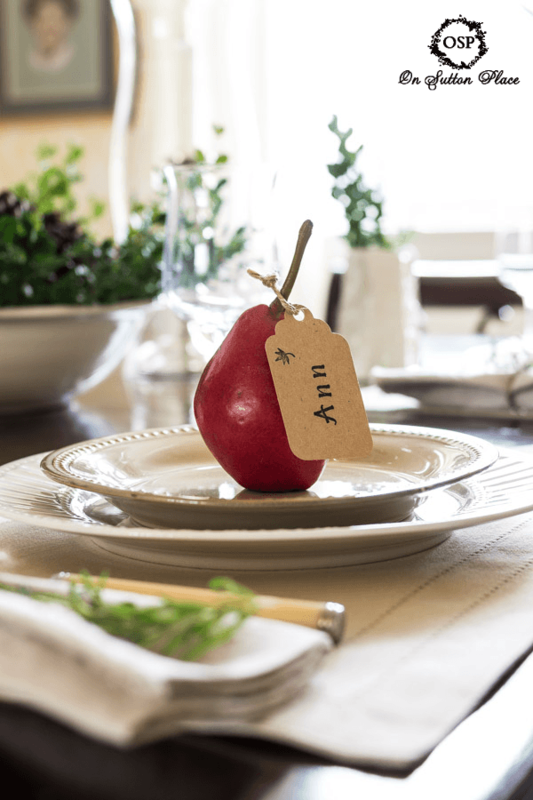 Love the apple, what a nice touch for a place card setting! I love the fresh rosemary at each place! I will be borrowing that idea, thank you! Love the Boxwood with the pine cones centerpiece. Saving that inspiration for a Christmas dinner. I have never used place cards for our Thanksgiving dinner, but after thirty-two years, I guess it’s never too late to start. Treating my special veteran to a Cuyahoga Valley train ride this day.